These little guys were smaller than a mouse. About 42 million years ago, minuscule primates, about half the size of a mouse, once lived in tropical rainforest canopies where they took tiny bites took tiny bites took tiny bites of fruit and insects with their tiny little mouths. They left behind a huge bulk of fossils in China, where scientists have been slowly collecting and identifying them over the past two decades. Now, a new study analyzing 500 of their seed-sized finger and toe bones, a team of American and Chinese scientists reveal that the ancient anthropoids were precursors to modern primates — including us. In the December edition of the Journal of Human Evolution, the scientists, led by Daniel Gebo, Ph.D., of Northern Illinois University, say that the hundreds of phalange (finger and toe) bones came from nine different taxonomic families of primates that encompass 25 species, including the Eosimias — — which is believed to be the earliest anthropoid identified to date. Eosimias are believed to have lived in China 42 million years ago and were only the size of a human thumb. Fossils belonging to this species were first identified in 1999, and since then, anthropologists have found more and more evidence of their existence in the Jiangsu Province of China. Jiangsu Province, where many of the tiny fossils were found, is outlined in red. The researchers also analyzed three other unidentified fossils, which are believed to have belonged to a new and “much more advanced” species of anthropoid. Within the primate group, lower primates, like lemurs, have broad fingertips, while higher primates, like chimps and humans, have narrow fingertips. The three unidentified finger and toe fossils reveals that they had narrow finger tips as well. 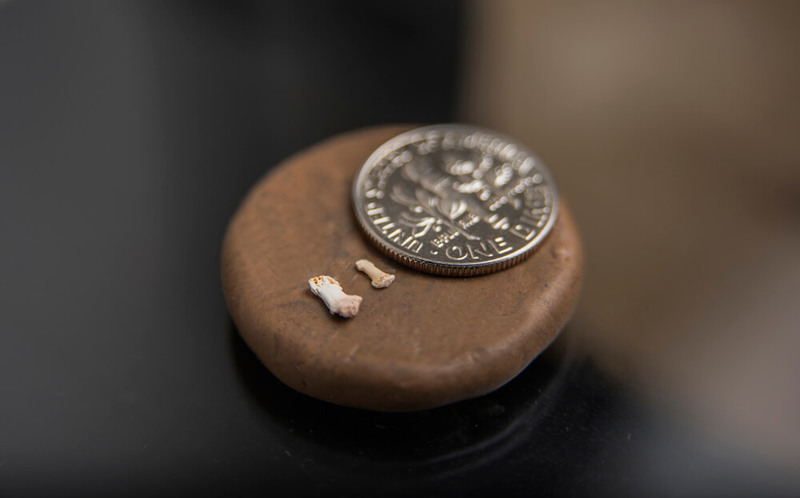 “The new study provides further evidence that early anthropoids were minuscule creatures, the size of a mouse or smaller,” Gebo said in a statement. This fossil collection is the earliest known example of narrow fingers and toes, which Gebo says is “key to anthropoid evolution.” Because of the sheer number of fossils collected, the scientists have a record of evolution as it occurred at the Chinese site, as the bones transition from broader to more narrow. Little bones mean minuscule creatures. As this assemblage of fossil primate finger and toe specimens is the largest ever recorded from a single site, that means there are still plenty of specimens for the scientists to continue to analyze and place on the archeological record. While scientists are growing a steadily larger group of knowledge about how early life emerged and evolved on Earth, there are still huge swaths of information missing from the human record. Fossils like these are an exciting addition to what we know about primates before hominids evolved from the pack — and a nice reminder that our ancestors were once smaller than a chihuahua. If you liked this article, check out this video about a 99 million-year-old dinosaur fossil.